I won’t try to rationalise the level of unadulterated indulgence here. 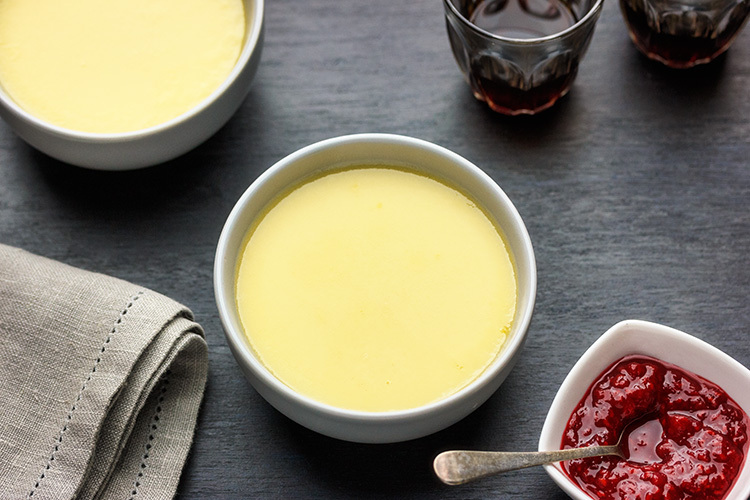 Baked custards aren’t diet food, and the addition of white chocolate doesn’t help matters. They haven’t been reverse engineered to be shoehorned into the latest fads – “keto caramel cheesecake”, anyone? They are gorgeous treats, special occasion desserts. Moving on. My guidance – for both custard-making and life in general – is to go gently, confidently and calmly. Use as little heat as possible to melt the chocolate into the cream and milk, and take it off the heat as soon as that job’s done. Take your time adding the mixture to the eggs and stir lightly but thoroughly with a fork. Be serene and everything will turn out beautifully. Use good white chocolate from a bar rather than baking chips, which have ingredients added to hold their shape. My favourite is the New Zealand brand Whittaker’s, but it can be elusive; Green & Black’s is easy to find and excellent (you can omit the vanilla extract if using it); for extravagance, Valrhona. Lindt fans, choose the Extra Silky White from the Excellence range (again, no need to add the vanilla) over the filled Lindor White. While these are perfectly fine on their own, I’ve included a recipe for a quick raspberry sauce – a compote, if we must – as an accompaniment. The slight tartness of the berries is a perfect foil to the custard’s creaminess, and the colour is glorious. Set your oven to 175°C (350°F). Chop the chocolate into small pieces or just snap it into individual squares. Stir the chocolate, cream, milk and sugar in a small, heavy-based pan over low heat just until the chocolate melts. Remove from the heat and set aside to cool for a few minutes. In a small jug, like a measuring jug, beat the egg and extra yolk together with a fork. Slowly add the chocolate mixture, stirring gently and continuously until combined. Put two small dishes, with capacity of 180ml (¾ cup) each, in a cake tin or small roasting tin. Divide the custard between the dishes. Pour hot water into the tin until it comes halfway up the sides of the smaller dishes. Cover loosely with a piece of foil. Carefully transfer to the oven and bake for 45 minutes. The custards are cooked when a sharp knife inserted halfway between the edge and the centre comes out clean; the centre should have a little jiggle about it, and they will continue to set more once out of the oven. Remove the foil and lift the custards out to cool on a wire rack. Leave for at least 10 minutes before serving, or serve at room temperature, spooning over some of the raspberry compote below. They can also be served chilled, if you like, in which case gently press some cling film onto the surface to stop a skin forming (unless you like it, of course) before stashing in the fridge. You can substitute fresh lemon juice for the Chambord – besides its flavour, I only use it because there’s been a bottle hanging around for a long time and, you know, any excuse. Put the sugar, water and Chambord (or lemon juice) in a small saucepan and stir over low heat until the sugar dissolves. Add the raspberries and bring up to a vigorous simmer. Let it cook for 10 minutes, stirring occasionally, until jammy and thickened. Leave to cool to room temperature if using on the same day, or store in the fridge, if required, for up to 2 days.